If anyone thinks Chris Morgan took a back seat after this summer’s managerial change at Sheffield United, they don’t know the man. Or Nigel Adkins and the emphasis he places on Morgan’s role. The Blades’ former long-serving skipper, whose testimonial game is this weekend, switched back to being purely Under 21 boss following the sacking of Nigel Clough, who involved Morgan with the first team. 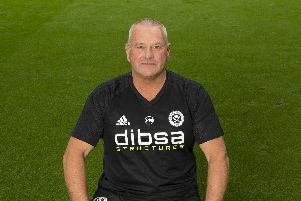 But one thing that has definitely not changed is the club’s commitment to youth and Adkins has made that clear to the man who is effectively reserve team manager at Bramall Lane. It’s also a way of working that has brought Adkins success at his previous clubs. “Nigel is very keen, like at Scunthorpe and Southampton, to progress players through the system,” Morgan told this column, pointing to how Saints, post Adkins, have been able to sell many players, including the likes of Rickie Lambert and Adam Lallana, for big money – because they’ve have had talent waiting to replace them. That said, Morgs has seen enough furniture change around him as he enters his fifth year as a coach to know that only one thing really counts this season. “From when I started coaching under Danny Wilson, through David Weir and Nigel Clough, the script has always been the same. Promotion is demanded. It’s easy demanding it but it’s not easy to do,” he says. Mind you, he concedes with a chuckle that, as the most sent-off player in Blades’ history with six red cards, he’d have to be “a hell of a lot different” in his approach if he was starting his career under today’s refereeing. It’s far from the abiding memory, though, of a fearless, ultra-combative centre half who starred in a promotion to the Premier League and has now served United with distinction for 12 years. Chris Morgan’s testimonial game brings Newcastle United to Bramall Lane this Sunday with three charities – Weston Park, Bluebell Wood and the Gary Speed Trust – sharing in the proceeds.